△Keep your Vinyl in peak playing condition! △Please read all instructions before first use. These instructions are to ensure you obtain the best performance from this product. △Place your vinyl on the record player to start rotation. △Take the protective cover off the brush. △Holding the silver part of the brush, gently position it in the grooves as the record spins. Let the record rotate a few times until all dust has been collected. Ensure the carbon fibre bristles or velvet pad are the only parts of the brush to touch your vinyl record. △Keeping the brush on the vinyl, carefully pull the brush toward you and try not to lose any of the collected dust. △Use a small brush (not provided) to clean the velvet surface. △DO NOT touch the carbon fibre bristles or subject them to undue pulling or bending. Now Enjoy the great sound of a clean record! [Conductive synthetic fibers&Velvet pad ]Safely removes dust and contaminants from your vinyl records meanwhile help to dissipate static. [Sound Great]Helps Maintain the lifetime of your cartridge and improves your sounding quality by reducing surface noise. [The Most Competitive Price]We offer a Competitive price it means you spend less can get a suitable products,why not? [Warranty]Two Years Satisfaction Guarantee,any quality problems,Returned it when you received the products. 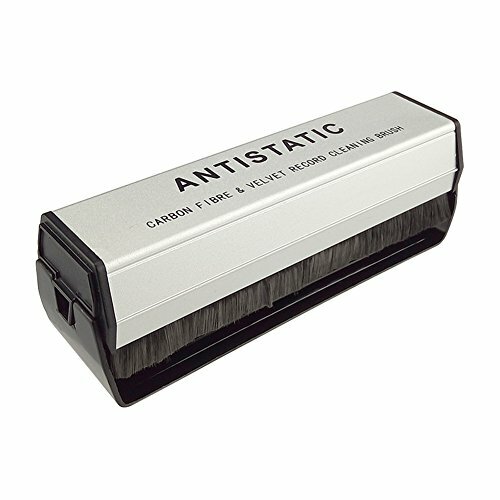 [Gift]Carbon Fiber & Velvet record brush makes a great present for any audiophile. If you have any questions about this product by Record Master, contact us by completing and submitting the form below. If you are looking for a specif part number, please include it with your message.